HomeGreat playWriters’ Weekly – 34 – What a lead! Writers’ Weekly – 34 – What a lead! Stig Drangsholt - Espen Fasting made you go down in a laydown slam! As declarer, you hope not to get the toughest guess in the first trick, but this happened at the Marit Sveaas IBT. The tournament was played at the Oslo Opera in august. The bidding was rough, but you are happy to stay away from the 5-3 fit in spades. 6NT seems to be a good spot, but then LHO leads the five of spades! So dear reader, how would you proceed as declarer after this lead? 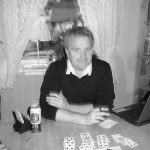 Your LHO is Stig Drangsholt, a well-known rubber player with a natural touch in the way he handle the cards. The question is simple. Do you think west could have led the five of spades from the ace or the queen? The most probably distribution would be to find east with both the ace and the queen of spades. But then again it is a slim chance that west is trying to fool you. I have seen people lead low from the ace in dummies first bid suit, but I have never seem them lead from the queen. Mr. Stig Drangsholt had led the five of spades from Q 5! How is that possible, I must say I feel sorry for declarer who really had no other choice than to play the king. East took his ace and returned another spade to the queen. One down gave the defense almost all the matchpoints – well deserved if you ask me!